I have a Content-Type called client and a Taxonomy term called Service. Inside the view I am showing content of type: node and grouping the nodes by the taxonomy reference field. Right now it is shown like this. The problem is the term reference field is allowing multiple and I want to show the node referenced by more than one Term, under each term instead of views creating a new term grouping. How can I avoid this functionality and have the view show this instead? 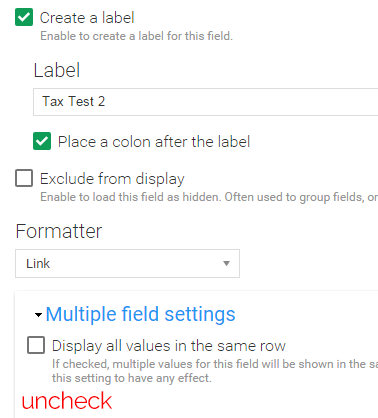 In the taxonomy term's settings, you need to uncheck the option for displaying the values in the same row. Create a new view of content, show fields. Not the answer you're looking for? Browse other questions tagged 7 views taxonomy-terms or ask your own question. Show the nodes number of a parent taxonomy term?